Where do I come up with these random topics anyway? Who knows? Also happy October 1st! 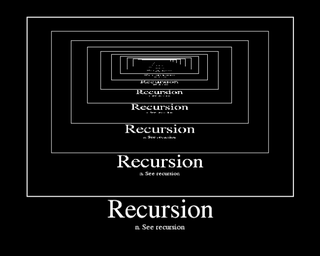 Anyway, what are some cool examples of recursion in shows or movies or games? I remember when they explored the idea a bit in season 9 of Red vs. Blue. It was a pretty simple example though. I'm sure the concept has been explored before though. Messiah Actually Posted a Question of the Day?